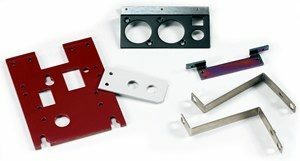 Metal Punching & Stamping | Quality Sheet Metal Inc.
Quality Sheet Metal offers metal stamping services to produce parts and components for a broad spectrum of industries, from medical and pharmaceutical to electronics and aerospace. Metal stamping applies high pressures to a flat metal sheet via a tool which presses the workpiece against a die to form the final net shape. Stamping processes vary by product and may consist of one or several operations performed either simultaneously or sequentially. The equipment used to perform these operations, known as stamping presses, may be operated by either hydraulic or mechanical means. Quality Sheet Metal offers short run metal stamping services for production runs of up to 20,000 components. Blanking is the process of cutting the stock metal sheet or coil into smaller pieces in preparation for stamping operations. The material that is removed is called the blank. Piercing is typically used when slots, holes, or other cutouts are required on the workpiece. This operation can be performed during blanking. This operation involves using a specially designed die and ram to apply a force to a workpiece to create bent angles. Forming is similar to bending, except multiple bends are created on the workpiece simultaneously to create a part with a specific shape. 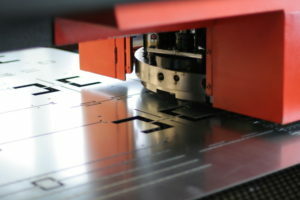 Air bending involves using a punching tool to force the metal sheet into a V-shaped die. This process is named such because the angle of the V-opening is typically deeper than that of the final shape. These processes are similar to air bending. However, significantly more pressure (2 to 30 times more) is used to create a permanent bend in the material. One of the main advantages of metal stamping is its accuracy and ability to meet tight tolerances. Each stroke of the punching tool is precisely programmed to perform forming operations with a high degree of precision. This results in the creation of high-quality parts and components that meet or exceed industry specifications. Since metal stamping processes are fully automated, parts can be produced with significantly faster lead times and with a high degree of repeatable accuracy, enabling large-scale production runs to be performed without compromise on quality. The precision of the metal stamping process also ensures that the vast majority of the stock material is used, resulting in the production of less scrap material. This combination of automation, speed, and waste reduction ultimately leads to a significant decrease in overall operating costs. Quality Sheet Metal offers a variety of metal stamping services to fabricate almost any metal part or component for a wide variety of applications. Our range of additional services also enables us to provide single-source solutions for all your fabrication needs. Are you ready to engage Quality Sheet Metal for your next metal stamping project? Feel free to contact our team to get started.